Thraikioi Prodromoi are an excellent and extremely versatile medium cavalry, capable of skirmishing, charging, and fighting fairly well in melee. 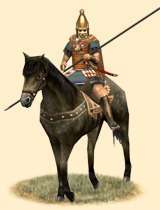 In the Thraikian and Makedonian armies, these medium cavalry are a common sight. The reason for this is that they are excellent medium cavalry, capable of skirmishing, charging, and fighting fairly well in melee. They are armored with good quality linen, bronze helms, and the distinctive Thraikian shields that mark their country of origin. They are an extremely versatile cavalry force that can be given the moniker ‘jack of all trades and master of none’. They are great all-round cavalry, but will not fare well against heavier cavalry or spear or pike armed infantry. They are drawn from the lower Thraikian nobility and many have settled in Makedonia, lured by land grants and higher pay. Historically, Thraikian light cavalry was some of the best in the ancient world. They proved their worth in battle after battle, whether in Makedonian or Hellenic service, or the service of their own kings. Their tactical versatility made them a light cavalry equivalent to that of the Romaioi legions, well able to perform any battle role and to adapt quickly to any circumstance.